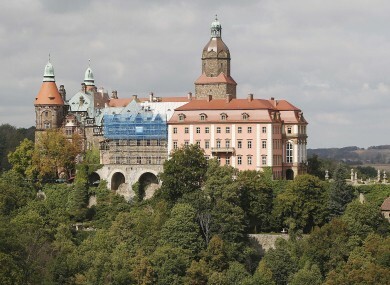 Ksiaz Castle in Walbrzych where two explorers found the secret tunnel that hid a wartime armoured train. POLISH GEOLOGY EXPERTS have said they have found no traces of a train at a site allegedly hiding a World War II Nazi train. Experts from the University of Science and Technology in Krakow examined the site in Walbrzych, in southwestern Poland, last month using magnetic and gravitation equipment. The rumours of the gold-filled train sparked a gold rush in September with people flocking to the site as this news report shows. The conclusion concerns only one of a number of sites in the Walbrzych area, where explorers claim war-time installations and even a train may be found. During the war, the Nazis built a system of underground tunnels in the mountains surrounding the city. Historians vary in opinion whether they were intended as shelters or secret weapons factory. Madej spoke at a news conference in Walbrzych. Speaking before him, explorer Piotr Koper said his examination of the site indicated there is a secret tunnel there and some readings on his geology equipment might suggest the existence of a hidden war train. Koper’s examinations were made earlier than those by the geology experts. Koper and another explorer, Andreas Richter, told Walbrzych authorities earlier this year that they had located an armoured Nazi train hidden in a secret tunnel by railway tracks in the city. Authorities asked geology experts to assess their claims. According to local lore, the Nazis hid a train with gold in a secret tunnel nearby while fleeing the Red Army in 1945, at the end of the war. The area was in Germany at the time but became part of Poland when borders were redrawn after the war. Email “No treasure found in dig for legendary gold-filled Nazi train ”. Feedback on “No treasure found in dig for legendary gold-filled Nazi train ”.